The 4-cylinder gasoline engine is mated to twin electric motors (each 60 kW) and a 70kW generator, which are powered by a 12 kWh lithium-ion battery. That is adequate enough to put out a total of 197 hp while paired to a single-speed transmission. 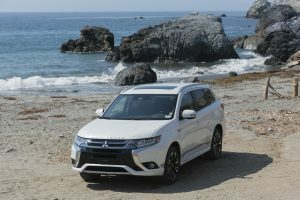 The SUV does offer a regenerative braking system for additional fuel savings. When the ride is coasting or the brakes are applied, the electric power functions as a generator, capturing kinetic energy that would normally be lost as heat through the brakes. Instead, it converts the energy into usable electricity for recharging the battery. 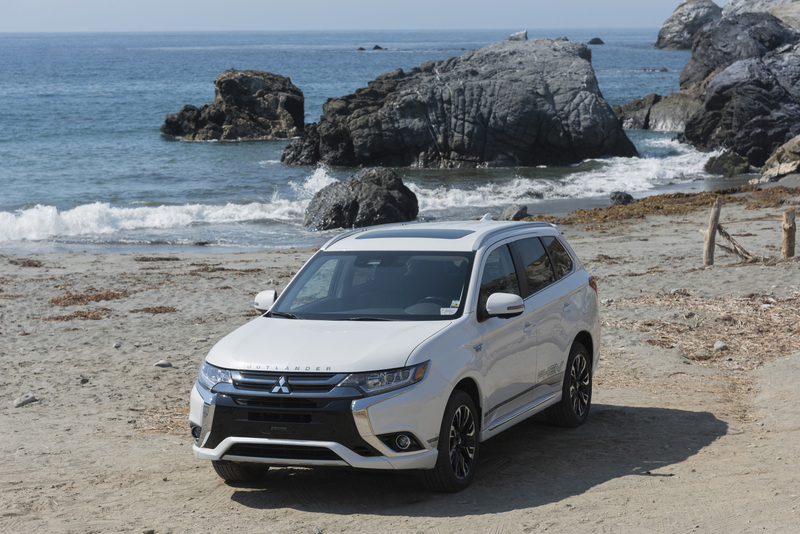 Though a plug-in hybrid, the Outlander shows off a bold look with LED headlights and fog lamps surrounding dark chrome grille accents, front bumper silver accents and roof spoiler. The cabin is spacious with a passenger volume of 101 cubic feet. The 7-inch touch navigation and display audio interface is easy to operate. The black instrument panel with silver accents conveys elegance found in high-end vehicles. Keep an eye on the rounded energy meter for fuel savings, which displays charge, eco and power readings. Several goodies are offered such as dual auto a/c, leather tilt/telescopic leather steering column and shifter, eight-way power seats, driver information center, 60/40 rear seat, power lift gate and sun roof, 710-watt Rockford-Fosgate sound system with nine speakers, under floor cargo hold, and a rear seat armrest with two cup holders. Dual front and side airbags, side curtain airbag, driver knee airbag, active stability and traction control, hill start assist, four-wheel antilock brakes, antitheft alarm, rear camera, blind spot monitor, rear-cross traffic alert, lane change assist and lane departure warning, front-pedestrian impact crumple zones, daytime running lights and tire pressure monitoring system are standard.